This guest post comes to us via Nick Rubright of Dozmia. If you think you have something worth sharing with the community, check out our guest post submission guidelines. 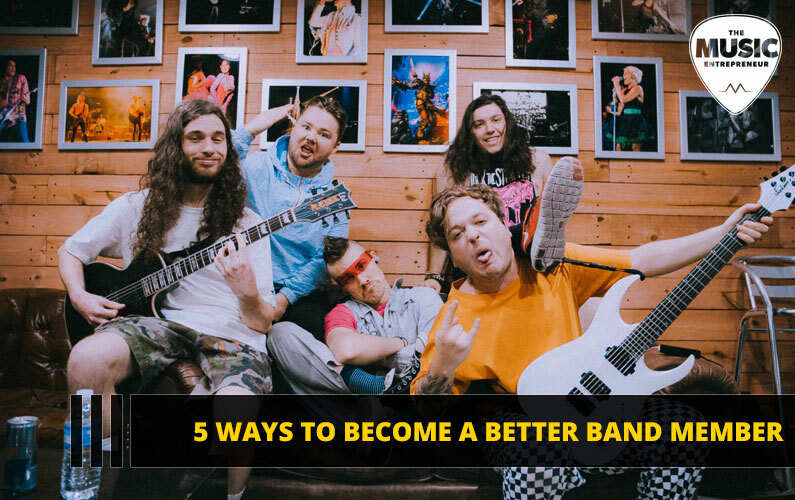 Alright, now let’s learn how to become a better band member. When you’re playing in a band, it’s important to maintain momentum in songwriting, recording, and gigging, but if you aren’t able to get along with your band mates, the ability for your band to keep these things going could be at risk. Oftentimes, we think our band mates are the problem, but if you take the time to examine your own actions and habits, you might find that you are a bigger part of the problem than you initially thought. To keep your band alive, you need to learn to be a team player – unless you want to leave your band, get yourself a looper pedal, and become a one-man show. Working with others can be tough. I recently started a band after meeting some great musicians that I worked well with, but I struggled to be a team player and it stalled our progress on many occasions. Nothing will piss off great band members more than not getting things done when you say you will. Stick to your word – if you say you’re going to work on a chorus, guitar solo, or a new intro – do it. Even if what you’re working on isn’t finished, have something to show at next practice. If you’re not a reliable band member, it’s unreasonable to expect that your band mates will be too. If you can’t complete a task or know you’re going to be busy for the next week, be honest – just tell your band members. It’s better to be upfront than to have them expect something and not deliver. Be quick to respond to texts or Facebook messages with your band mates. If they need some input from you on something before they can move forward, waiting days to reply can put a huge delay on your progress. Check your phone and Facebook accounts every night to make sure you don’t miss anything. An even bigger part of communication is being a good listener. This is personally one of my weaknesses, but being in a band has forced me to be better at it. For example, if someone who doesn’t understand music theory is trying to explain how they want a part to go, try and listen for what they mean instead of what they’re saying, because what they’re saying might not be exactly correct. When I started my band, I wanted to play faster guitar parts in nearly every song. After a few practices, I sat down with my band members and tried to get a better understanding of what everyone wanted. We all had different music tastes, but we had one song that we’d written that all of us loved, so we decided to base our style around that. Unfortunately for me, it didn’t have fast guitar parts – it was a pretty basic song with standard three and four-chord progressions – but this ended up being the best decision for the band and is what gave us our somewhat unique sound. It’s best to move forward with something that the whole band is on board with. Do what you can to keep your band members happy, not just yourself. If you write something and it just isn’t what’s best for the song, set it aside and try not to be too attached to it. It’s difficult, but it’s worth it in the long run. If you want to get the best out of your band, you need to be like family. Getting together with your band mates outside of practice strengthens your personal bond and allows you to be more open with each other, which can spawn great song ideas, and will make your journey to fame and fortune more enjoyable for everyone invovled. This was another of my biggest weaknesses. When I started playing in this band, I became very attached to some parts and songs I wrote. Once I started to be open to changes, my drummer, vocalist, and I started working all of our ideas into songs, and they became much better as result. Additionally, make sure you’re open with your band members if you don’t like a part of a song. When my band went into the studio to record one of our first songs, nobody liked the chorus – we all just thought everyone else did. Had someone spoken up, we could have made the appropriate changes to the song before the studio dates. It’s also important to be honest with yourself about the parts you write. Are they really what’s best for the song? Did you give yourself enough time away from the part to form an outside perspective? If your band mates don’t like something you’ve come up with, don’t take it personally – nobody is perfect. Just keep writing until you can come up with something everyone likes.